We live in a world of many options. When it comes to selecting a summer program for your children the situation isn’t much easier. However, when parents search for an enriching experience for their children that will allow them to explore new skills and activities, YMCA Camp Watchaug is the program of choice. Our dedication to safety, and our drive for the ultimate summer experience for every camper sets us apart. Please don’t hesitate to browse the 2019 Camp Watchaug Parent Handbook and call with questions as that’s what we are here for. We look forward to speaking with and meeting every one of you! The most critical piece to a successful camping experience are the staff. Camp Watchaug prides itself on our hand selected staff that will be working directly with our campers in daily activities and leadership. Our staff are Professional Role Models. They exemplify the Character Values of the YMCA; Caring, Honesty, Respect and Responsibility through their leadership and ensure our campers show the same values while at camp. We’re here to do more than just play games, but rather teach new skills, introduce campers to new friends, lead team building efforts and keep our campers safe everyday. All camp staff go through an extensive hiring and training program. Staff undergo a rigorous interview, criminal background check and three character references prior to being hired. Once on the team, they complete a week of staff training which includes child abuse prevention, camper behavior management, child development, leadership skills, first aid and CPR certification, safety training and more. We know you have questions so we are here to help and answer as many as we can as quickly as you need them. Browse the most commonly asked questions and the 2019 Camp Watchaug Parent Handbook. If you still find you have questions, don’t hesitate to ask. Camp Watchaug adheres to the American Camping Association guidelines for appropriate staff supervision. We meet or exceed the standard with a staff ratio of 1 counselor to every 10 campers at the greatest, however our younger campers receive smaller ratios to ensure the best supervision possible. Is child care coverage available before and after camp? Designed to meet the needs of our working parents, Extended Day programs run at the Westerly and Arcadia YMCA before and after camp. Campers will be transported by bus between the Y and camp and will participate in well supervised recreational activities. What emergency response training does your staff receive? All staff are trained in CPR/AED/First Aid and all of our waterfront staff are certified and licensed lifeguards. We train and practice routinely throughout the summer. There is an Automatic External Defibrilator (AED) and all the necessary professional rescue equipment at the camp site. First, each camper should bring with them energy and enthusiasm to learn and explore new activities and meet new friends. Second, they need a good rest to get through our packed days of activity. And third, they should bring the following with them, all labeled with their name! What is a Trading Post Card? Campers may purchase Trading Post Cards for $10 each during the registration process or at any time during the summer. No cash is to be brought to Camp! Store cards are non-refundable and non-transferable. Campers may purchase one snack each day and/or a drink. The following snacks are the ones we usually offer: Assorted Baked Chips, Sun Chips, Smart food Popcorn, Goldfish, Pretzels, Animal Crackers, Applesauce, Popsicles, Juice Boxes, Gatorade, Bottled Plain and Flavored Water. Please discuss with your child which options you would prefer they choose. Most snacks and drinks are $1.00. There are also camp logo items available such as t-shirts, bandannas, water bottles, carabiners and sunglasses. Our Store system is “Old School” and the Trading Post Card is literally a piece of tag-board upon which we write your child’s name, session and group; and has ten $1.00 notes on it that we cross off as your child purchases items until used up or the session ends. We hand out the cards right after lunch and then collect them when your child comes to the store so they only have them for a short period of time – cuts down on lost cards. Sometimes, cards do get lost, not made up, or put in the wrong envelope – this is especially true if your child switches sessions or groups. If you purchased a card for your child, ask him/her if they got it on the 1st day of camp. If not, please call us and we will sort it out right away. What do the campers do on Rainy Days? Our campers and staff will always tell you that it never rains at Camp Watchaug, it is just a little “dewey.” Our Rainy Day programs are organized and setup during staff training every summer so that our staff and directors are ready to go for any inclement weather. We try to stay outside during the lighter rains. Be sure to send appropriate rain gear if there is a chance of rain! When camp experiences heavy rain or thunderstorms we keep our campers in enclosed shelters throughout the property and conduct our prearranged curriculum. 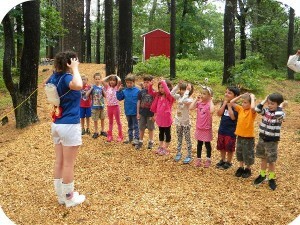 Camp Watchaug is organized by the Camp Director who is a full-time professional Director with the Ocean Community YMCA. The Camp Director also works with 2-3 program directors who manage the waterfront, offices and health care, and specialty camp programs. These full-time YMCA Directors supervise our summer program staff and counselors. Does the camp follow any National Camping Guidelines? Camp Watchaug follows the YMCA Best Practices for Camps. The camp is also accredited by the American Camp Association (ACA). ACA is the only nationwide organization that accredits children’s camps. The ACA accreditation process is a voluntary commitment by Camp Watchaug to the highest standards of health, safety and program quality.